I’m getting a red squiggly line underneath “unironically” but I’M GOING FOR IT ANYWAYS because I’ve got to my article in! Two decades ago (two. decades.) Nintendo Power was thriving and life was good. Every now and again, subscribers would get something awesome in the mail- an exclusive Pokémon card, a pack of stickers, a strategy guide. There were a million reasons to subscribe to NP Magazine as a kid, the free stuff was just a bonus. There really is nothing like reading a magazine- the fact that the internet killed my favorite magazine as a kid is worthy of another post entirely- but what I loved about Nintendo Power is that they really tried to keep things unique. 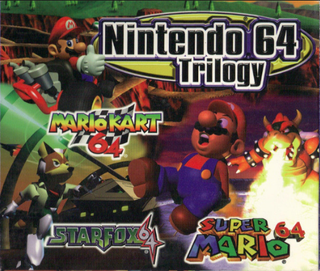 The best “perk” I ever got as a freebie was the Nintendo 64 Soundtrack Trilogy- featuring the soundtracks to Super Mario 64, Star Fox 64, and Mario Kart 64. After I got those soundtracks, I was hooked. Every few months NP would release a catalogue of stuff to send away for. I picked out the Ocarina of Time soundtrack, and once I received it (4-6 weeks later, mind you) I listened to it nonstop. After Majora’s Mask was released, my friend Josh picked up the soundtrack and burned it for me (as someone who never used Napster, this was tantamount to thievery and I was nervous about accepting the gift of a burned CD). Somewhere around there is when I fell in love with video game music and soundtracks. Some days when I was playing Ocarina I’d just hang out in the Temple of Time or a fairy fountain just to listen to the music loop over and over again. I did it in Majora’s Mask too- I’d park it by the Happy Mask Salesman and listen to the Clock Tower Theme for minutes on end. All of us have that one soundtrack from a video game that hits us just right. For me it’s probably the Overworld Theme from Super Mario World, or even the iconic Super Mario Bros. theme. Final Fantasy games are renowned for their music but I didn’t play many of them when I was younger. If I have the chance I’d definitely go and see a live orchestration of the music, even though I’m not as familiar with the major scores. There’s a Zelda version of that too that isn’t touring at the moment, but I’d love to hear it someday. Mixed in with all this is all the stuff that comes after video game soundtracks- stuff like Starbomb or Big Bad Bosses, stuff that has a clear love and reverence for video game music, and is even inspired by it to some degree. I love hearing someone remix a classic theme or find a bass line they love and do a rap over it. I love how guys like Disasterpeace are involved in indie development so much so that the music becomes an integral part of the world. I love that there’s a 33 1/3 book about Kondo’s Super Mario theme. I’m not a super musical person these days- I usually listen to podcasts more than music when I’m driving around. But video game music will always have a special hold over me.